IMPORTANT: Following my initial post yesterday, I found new and different information on parking costs for underground garages. Please see important updates at the end of this post. Why does it cost twice as much as normal underground garages? Last week, I contended that the trouble that developers were having in issuing the garage bonds portended bigger problems for the CentrePointe project as a whole (regardless of whether the new mystery partner works out). But despite all of my criticism of the financing for the garage and the viability of the entire project, I never thought to look at the cost of the CentrePointe garage itself. In the course of his comments, Webb shared intriguing details about the finances and the challenges for CentrePointe. In justifying the pursuit of TIF funding for the parking garage, for example, Webb casually dropped that the CentrePointe garage would cost $50,000 per space (largely driven by the requirement for underground parking). He claimed that “those numbers don’t work”. At 700 spaces, that adds up to about $35 million for the entire parking garage. That figure seems roughly consistent with other estimates on CentrePointe: The most recent publicly-available figures [PDF link] put the parking garage at $31.9 million, which worked out to about $45,500 per space. The $50,000-per-space figure fits with the developer’s propensity to throw out big, round numbers, but it isn’t that far from what they’ve previously claimed. So I didn’t pay that much attention to it. Yesterday, I was engaged in an online discussion about CentrePointe, and one participant asked me a number of pointed questions about how the parking garage worked. That was when I realized that, while I knew quite a bit about the scheme to pay for the garage, I knew very little about the business model of the garage itself. 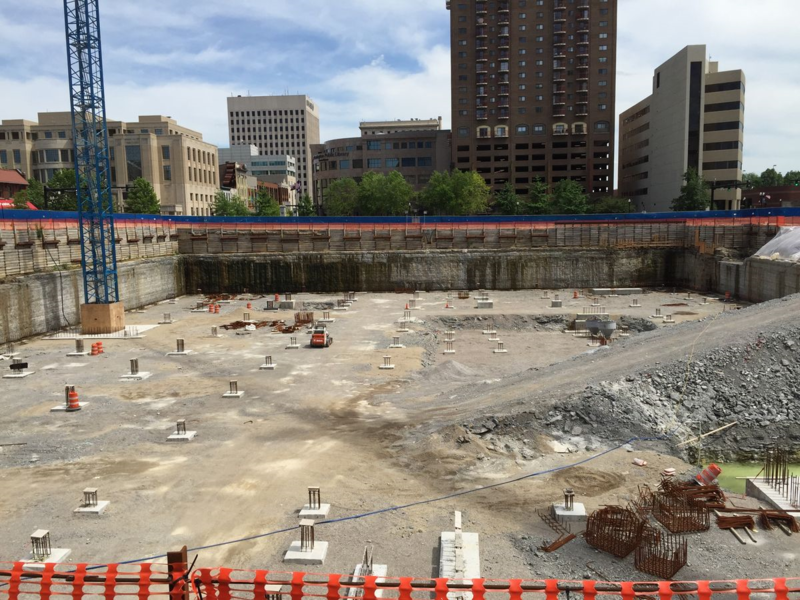 As I began to dig, I started to see that CentrePointe’s parking garage is wildly overpriced. As I looked at parking garage studies and parking garage construction from around the country over the past 5 years, one particular figure popped up again and again for the cost of an underground garage: $20,000 per space. These garages had about the same depth as CentrePointe. They had about the same capacity as CentrePointe. Nothing in the way that CentrePointe’s garage has been described makes it sound especially unusual compared to other underground parking garages around the country. And yet, the CentrePointe garage appears to cost over twice as much as standard underground parking garages. If CentrePointe used a more realistic $21,000 per space, then its 700-space garage should cost only $14.7 million. But the CentrePointe documents show the parking garage costing $31.9 million…. Where did that extra $17.2 million come from? Welcome to the Great CentrePointe Parking Garage Mystery. As far as I can tell, there’s never been a detailed public accounting of the costs of the garage, so I can’t tell you where these phantom ‘costs’ came from. The garage costs were simply inflated. A lot. And the developer hoped that no one would notice. The property costs (or some other non-public-infrastructure cost) were rolled into the garage costs. And the developer hoped that no one would notice. And for over seven years, it seemed that no one noticed. In either case, however, the result would be the same: The developer would get to pocket an extra $17.2 million funded with our tax dollars. But why does that really matter? Second, overpaying for the garage crowds out funding for truly public infrastructure. Renovating the old Fayette County Courthouse, in particular, was supposed to be part of the CentrePointe TIF, but seems to have dropped out of the most recent TIF funding efforts. We should put it back in. It is time to ask the developer sharper questions about the cost of his parking garage. I apologize for not finding these sources before the original post. I don’t want to mislead anyone. I do want to understand these costs better. While these amounts would change the magnitude of the amounts I calculated above, they don’t change the core critique of the parking garage for CentrePointe. Factoring in these new amounts, it seems that CentrePointe’s parking garage is still overpriced by between $10,000 and $20,000 per space, which amounts to extra costs of between $7 million and $14 million across the whole project. Asking the developer sharper questions is still warranted. used it quite often for lots of fun events that brought people downtown. We really don’t need Center Point there. The current business spaces that are not being utilized downtown should be filled first and foremost. A new venture will only take away from those spaces. I’m sure that there are lots of people in Lexington that share my same sentiment. I hope the hole will be filled. A few things + and – to consider. Boston in particular and NJ comparative costs probably don’t have the limestone we have here, and that could be a very large cost difference. OTOH, I expect parking costs in Boston and parts of NJ are high enough that the payback is really pretty reasonable, and I believe payback is a better way to gauge cost reasonableness. I can’t quote those cities, but I’ve seen $65/day in Chicago prime downtown areas – and that was in 2007. So even $50/day * 700 spots (and yes they’re filled or possibly even over-subscribed (pay for x hours but leave and it gets re-rented) * 250 work days per year is over $8.75 MILLION per year! Not a great payout period but for a public/semi-public work probably not untenable. Except… We’re not Boston! Only the Webbs or folks with that wealth could afford to pay this to park, so one would have to see what the going rate for hourly/daily parking is to see what a reasonable price for this garage is. That WOULD be higher than on street/adjacent open lots because it’s covered, a great location, etc. So folks likely would pay a bit more to park there… but not $50/day! Upshot: their costs are probably higher than some areas due to limestone in the dig. But construction cost won’t necessarily have a lot to do with what the market will bear to park there, and payback feasibility should be the best way to determine if the business model is reasonable or stinky. Webb may say you can’t do this, the garage must be taken in context of the whole development. The problem there is how the deal/bonds/city/TIFF is put together, not to mention there is no credible reason to believe anything past the garage will be created on a reasonable horizon. At this point, I’d be happy to see the garage on top of which we could still plant grass! I think that the Lexington market might not bear rates which would make the business model work. According to LexPark, the highest current daily rates are about $12.50 and the highest monthly rates are around $100. For some reason Joe and the Dud still want a free parking garage. Again the Dud has filed multi-million dollar bankruptcy four times, has two multi-million dollar liens on the CentrePointe Property and still owes the city for lost parking spaces, sounds like junk bond status from any economic perspective. Several underground garages are prefab so what is the delay? How hard is it to lay rebar and forms to pour concrete made right in Lexington at Forbes road and Manchester street?